I was on the cruise, living on the ship, but the ship did not sail until after the day of the Valley of the Kings and Queens. We set out early in the morning, still hot. 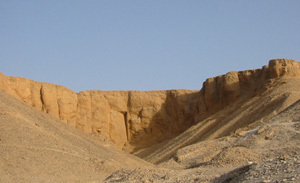 We were already tired from heat when we arrived at our first stop, Valley of the Kings. There were literally a valley of mountains, without any vegetation. In most unlikely places, we saw the openings of the tombs. The first tomb we walked into were striking in color, but much vandalism left me saddened. We were not allowed to take any photos so we tried to absorb it as much as we could by taking in sights like we breathed in the air.Each tomb we saw had various different themed wall reliefs and in various state of preservation. 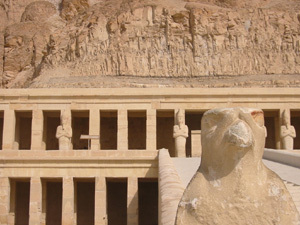 Our next stop was to the Temple of Hatshepsut. She was a very famous queen who pretended she was a man. How brilliant would she have been to be able to claim pharaohship as a woman? It does not matter if the successor tried to remove all trace of her by vandalizing all her creations. 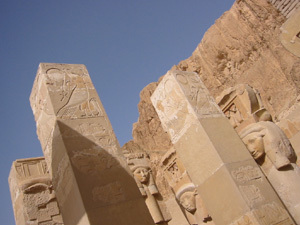 Hatshepsut had built numerous temples and obelisks. It was little sad to note that this modern day temple was not a preserved temple, but a reconstructed one. I can't imagine what grudge her successors had harbored her enough to destroy such beautiful temple. It is grand structure cut into the side of the Valley, with wide stairs leading to the multi-tiered little chambers. We walked to the top most level where we could see the still remaining wall reliefs of Hatshepsut, Tuthmosis (her co-regent and brother). I sometimes wonder if the marriage between brothers and sisters of ancient Egypt were indeed real or had been only symbolic. It is hard to imagine that race with such deep knowledge in medicine, art, music...so much culture could not have known about consequences of marrying close relatives. We headed to the Valley of the Queens afterward. 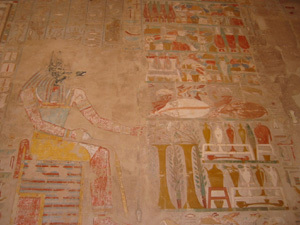 The tombs still held beautiful fresco, but the valley of the queens were quite different from the ones of Kings. 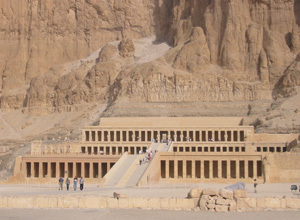 Unfortunately, the most sought after tomb of Nefertari (wife of Ramses II) had closed recently. I had so wanted to see the woman who had inspired such a powerful ruler, but perhaps I have to wait until my next chance.Instead, we were able to see the not so well preserved tomb of a queen who had actually been executed for a murder, a tomb with actually preserved 6 month old fetus, and the tomb of the boy prince who had been killed at a young age.Such stories these tombs tell!Our Nile Cruise began in earnest after our excursion. The ship began to move by the end of lunch time and we were sailing down the Nile. It was strangely a soothing experience although the temperature was hitting almost 130 that day. 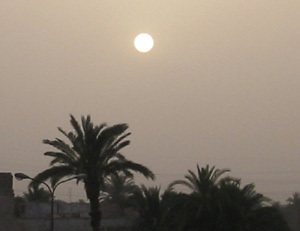 We had a very nice several days in Egypt, but I guess the heat wave had been unavoidable. In no time, we were by the locks waiting for other ships to pass through. I was awakened from the nap by the noisy voices. Since I had gone to sleep while ship was sailing through the Nile, the sight of merchants on the boat shouting up at our ship was an incredible sight. I could not comprehend how it is that they were able to follow alongside the boat to sell merchandises. It was very silly of me. 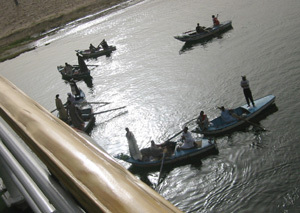 The merchants who came on the boat were incredible. They would throw their merchandises to the people on the Cruise ship and those would be thrown back if they were not wanted, if someone wanted to buy, the money is thrown back. What a way to sell! The rest of the voyage was not as exciting. We were due in Edfu in several hours and I spent peaceful hot hours on the deck observing the sights of daily lives along the Nile banks. 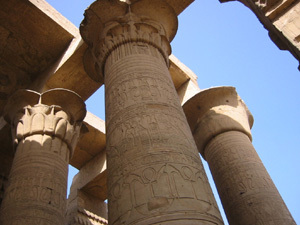 When we woke up, we were already docked at Edfu. We were taken to the temple by the way of horse carriage...little more hassle with the fee, but we arrived at the temple all in great spirit. 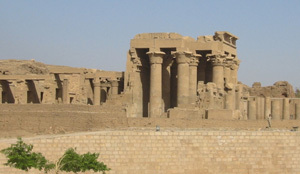 It was temple built in the era of Cleopatra, the famous one. Much had been restored and it was in better condition than some of the other temples I'd seen. As we walked through the grounds of the temple, we saw the flood meter which decided the tax and predicted the crop yield for the year. 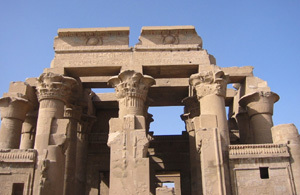 We saw the reminiscent structures of the very old temple that had once been there as well. 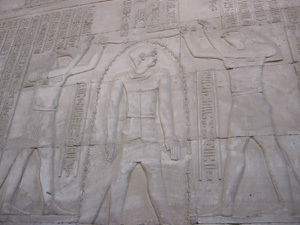 The main entrance to the temple had a very well preserved famous statue of Horus. It is sometimes very strange to see the falcon wearing the double crown of Egypt. 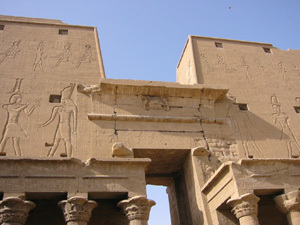 Edfu temple was pretty, but somehow I could not muster enough enthusiasm to wander too long. It was way too hot and I was sick as a dog with cold. Still, I would have rather died than not to see it. So I dragged my body through the narrow temple structure, to the secret inner sanctum. I almost thought I might be cured by being inside once such a spiritual place where only the priests were allowed...but in the end, I still felt crappy. Yet the stories were all written there of the medical equipments, the treatments. 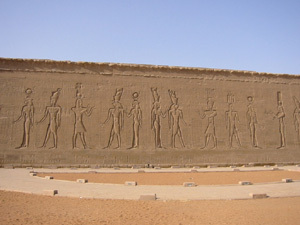 Egyptians firmly believed in psychotherapy before the surgery. It is phenomenal! Curing people through happiness and music rather than through medicine. Only if we did more of that in our modern day medicine. I am told that the temples of Egypt are built at each Chakra point...and depending on which point the temple lies, they are told to cure different parts of body. The eyes, stomach, fertility...Is it possible that we are misinterpreting their wall reliefs? 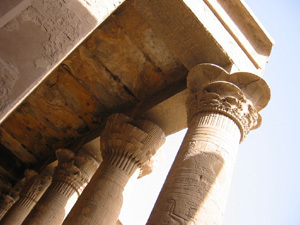 Such ancient civilizations with so much knowledge...where did it all disappear? Our last night at the cruise, we were treated to various dancers. One of which was a Sufi dancer. 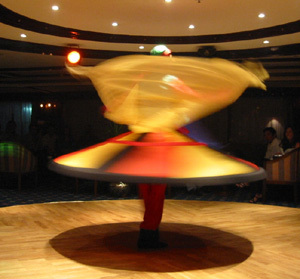 He was far more skilled than the one I had seen in Cairo, but Belly dancer left little to be desired.